Jade Mountain (玉山), Taiwan’s highest mountain at 3952m, can also be considered the high point of its own small mountain range. 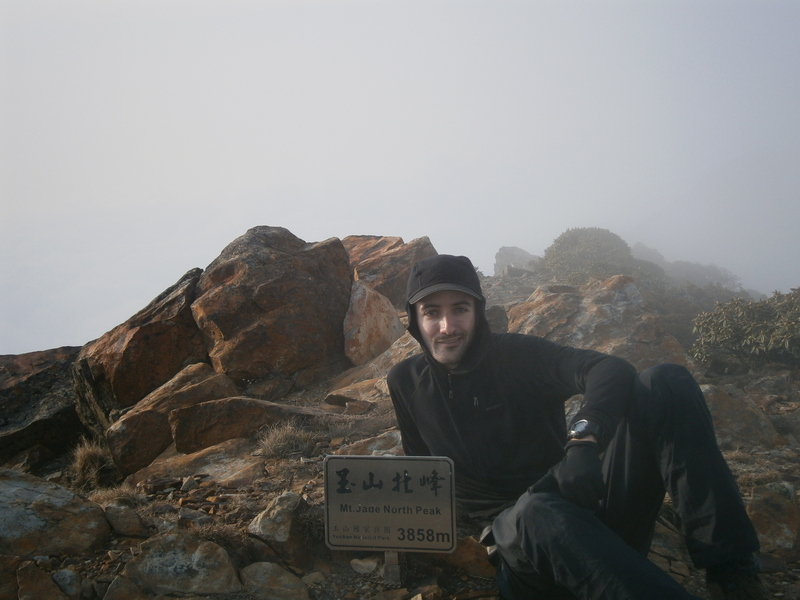 I’d climbed the remotest, seldom visited pair of mountains on this range, 3081 meter Xiluanda Shan (西巒大山), and 3263 meter Junda Shan (郡大山) a few weeks before this trip, and had already climbed the Main Peak of Jade the past December, forging through unpleasant weather to get to the top. A landslide-prone trail segment on the way to the Main Peak. 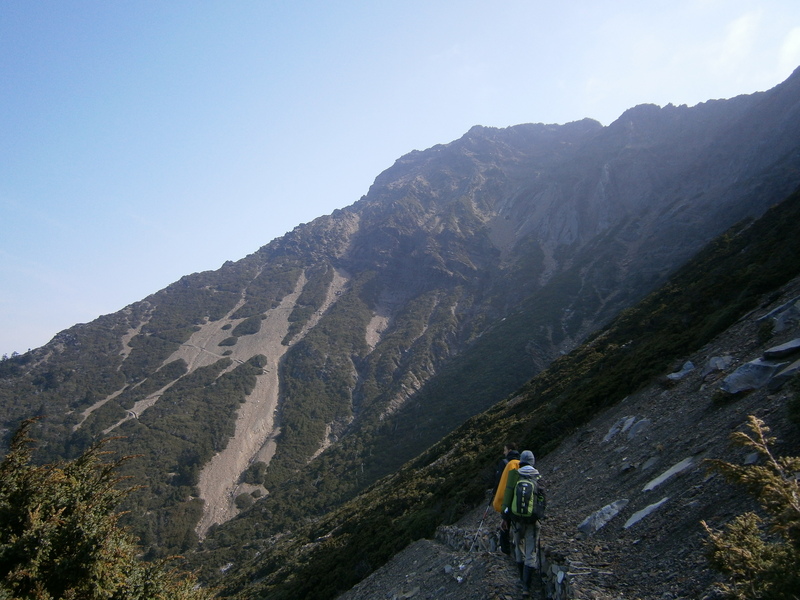 April is the beginning of spring in Taiwan, and prime hiking season. A return trip to Jade Mountain seemed to be a good idea, and I slowly put together an interesting itinerary for a three day trip. 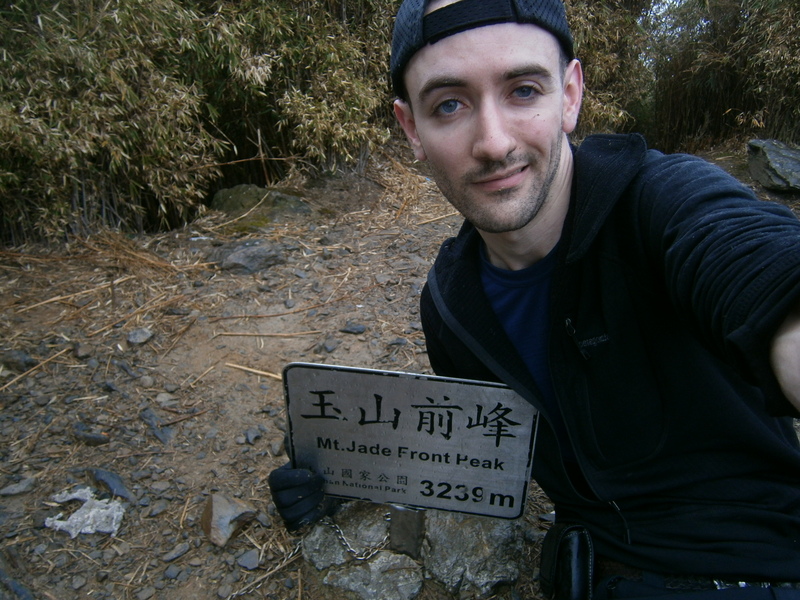 I made a plan; climb all seven of the 3000+ meter peaks near Jade’s Main Peak (saving the southwest Nanyu Shan and southeast Lu Shan for a later trip, given the additional two days required to reach them) in three days. 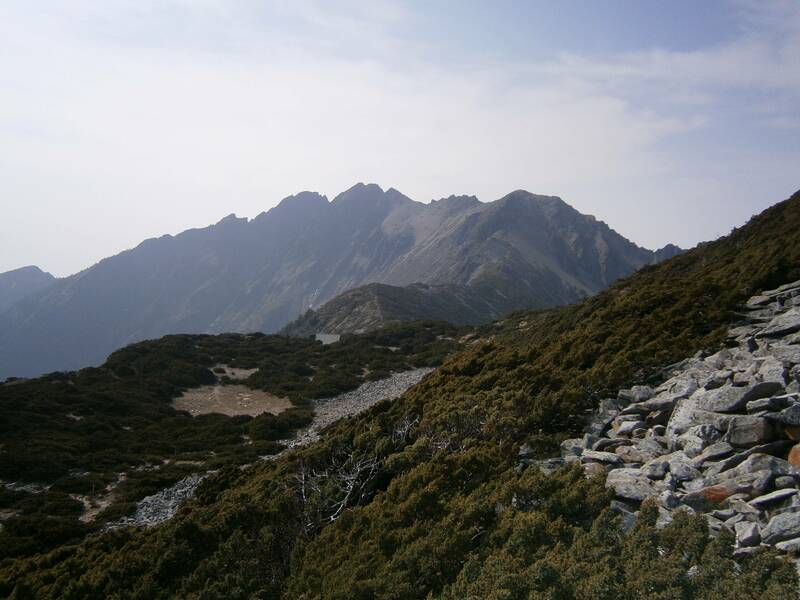 After hours of paperwork and correspondence with the Yushan National Park to acquire the necessary permission and park entry permits, the plan solidified. A few friends also decided to join me for the main summit. A map of my three day route. Day 0: Caught a bus from Taipei to Jiayi, and met a friend who conveniently lives nearby. Rented motorcycles, and drove three hours from Jiayi to the Tataja trail-head, went to sleep early in the Dongpu mountain hostel. Day 1: Started hiking up the restricted-access service road to the start of the trail at 4 a.m., slow with a heavy pack of camping gear and food (We ate very well; a gourmet – but heavier – menu of dumplings, meatballs, soup, noodles, canned fish, cheese, cookies, pizza, and an abundance of chocolate and snacks). A tiring beginning! Feeling sleepy, walking the police road to the trailhead. I reached the first trail split at 7 a.m., slightly ahead of the others, dropped my pack and burned up a steep trail of big boulders and scree to the first mountaintop of the trip, the Front Peak (3239m). The view wasn’t much to speak of, but the path up was a really fun scramble over huge rocks. Back on the trail by 8:30 a.m., caught up with everyone by ~10 a.m.
Jade Mountain’s Front Peak, seen from higher up the trail. On top of the Front Peak. 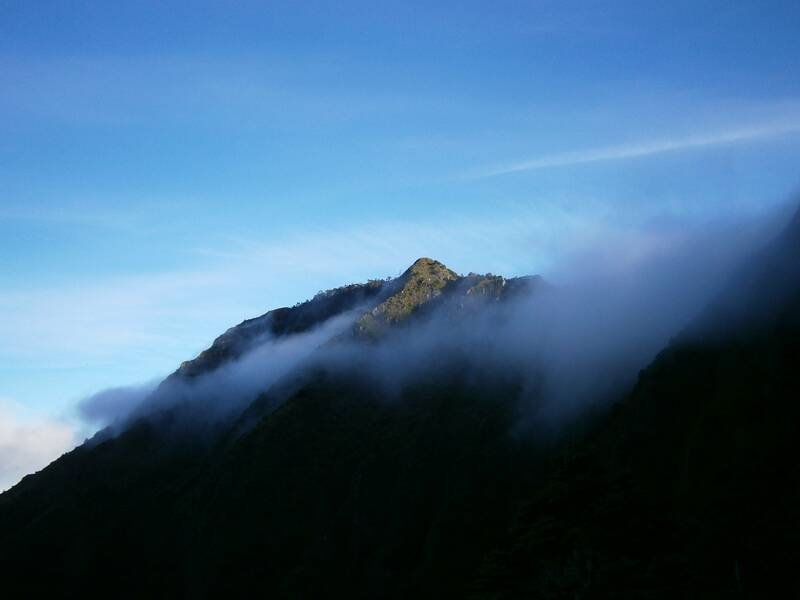 We had wonderful weather, and on the way to our campsite the clouds parted for a moment, revealing Jade Mountain’s distant Main Peak, bathed in sunlight. The Main Peak in a patch of sun. 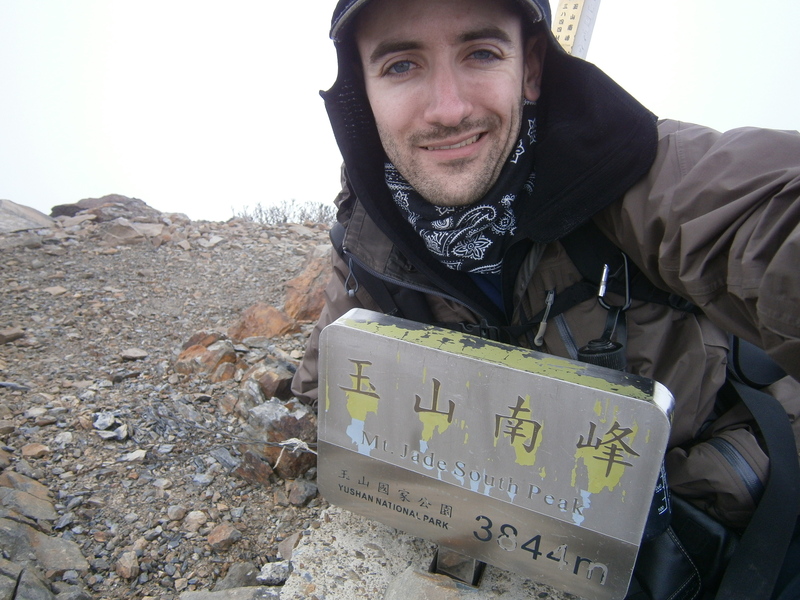 Reached the Yuanfong campground (above the treeline at ~3600 meters) at 1 p.m., where I unloaded and pitched camp. 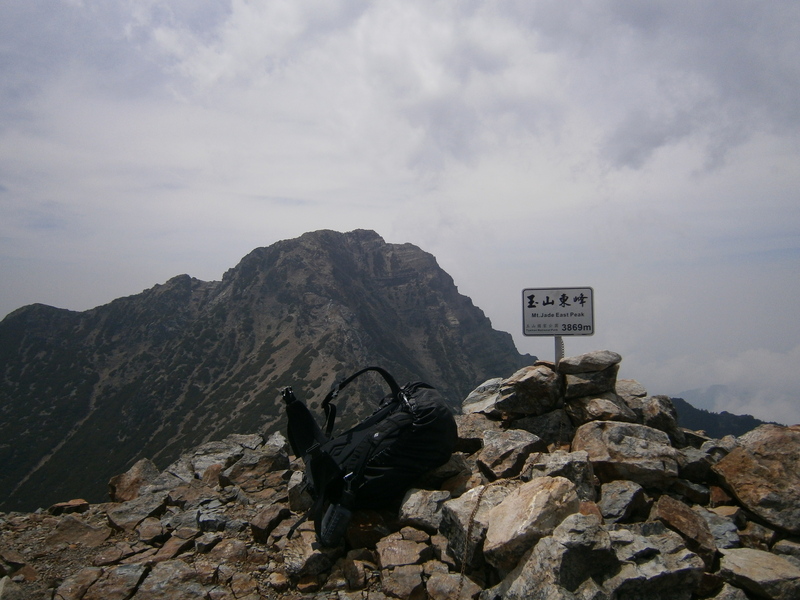 I left Yuanfong alone at 2 p.m., heading south towards the South Peak and Dongxiaonan Shan, the second and third mountains on my schedule. Clouds were rolling in, and the temperature dropped sharply. The ‘trail’ along the south ridge of Jade Mountain is wild and unmaintained – almost nonexistent for long stretches – a compass is mandatory for hiking here. 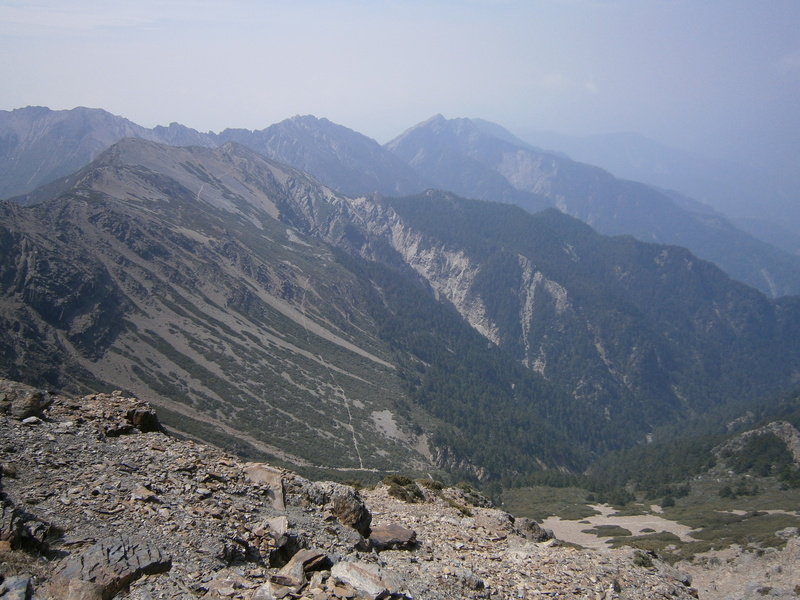 The ridge itself is made up of loose scree and boulders. Numerous ‘teeth’ and cliffs break the ridge apart, making it difficult to follow. The south ridge of Jade is jagged and sharp, featuring many eerie rock ‘teeth’. 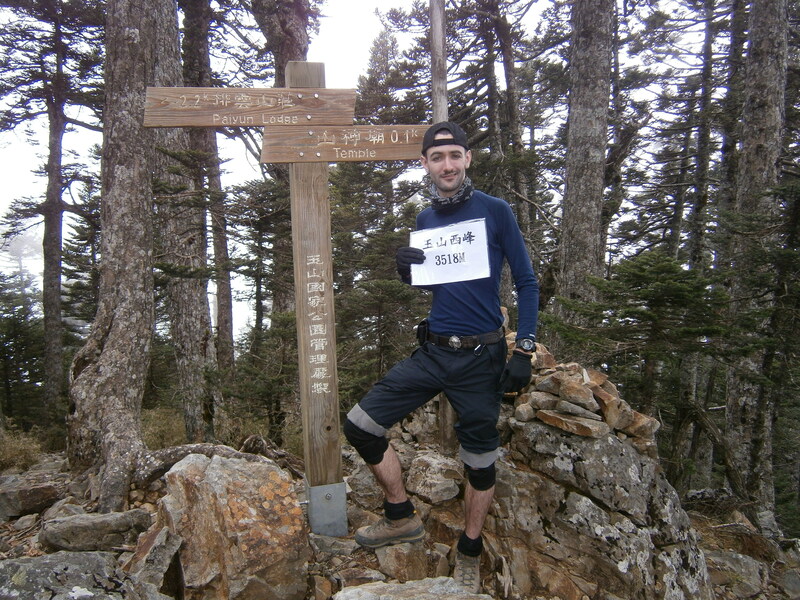 I reached the base of the barrel-like South Peak (3844m) at 2:30 p.m. It was definitely one of the hardest peaks of the trip, with some scrambling to the top. 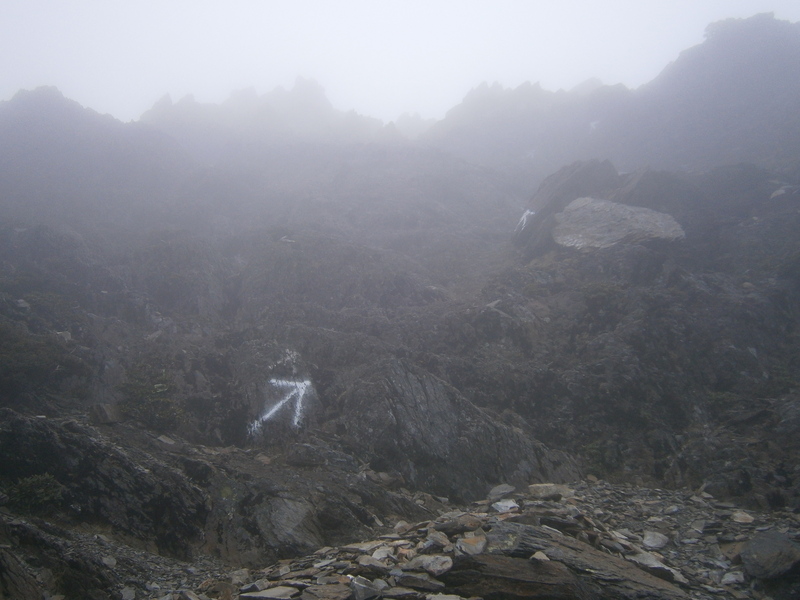 The route up the South Peak. Steeper than it appears pictured here! On top of the South Peak of Jade Mountain. Continuing south towards Dongxiaonan Shan, the weather worsened and thick cloud descended. Visibility was very poor. 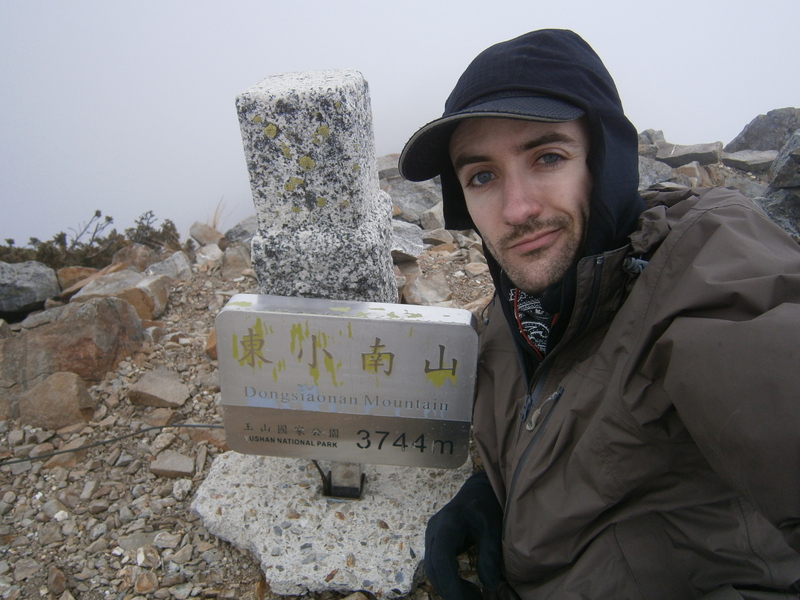 I reached the top of Dongxiaonan Shan (東小南山, 3744m) at 4 p.m. The name of this mountain doesn’t translate well; it literally reads “East Small South Mountain”. 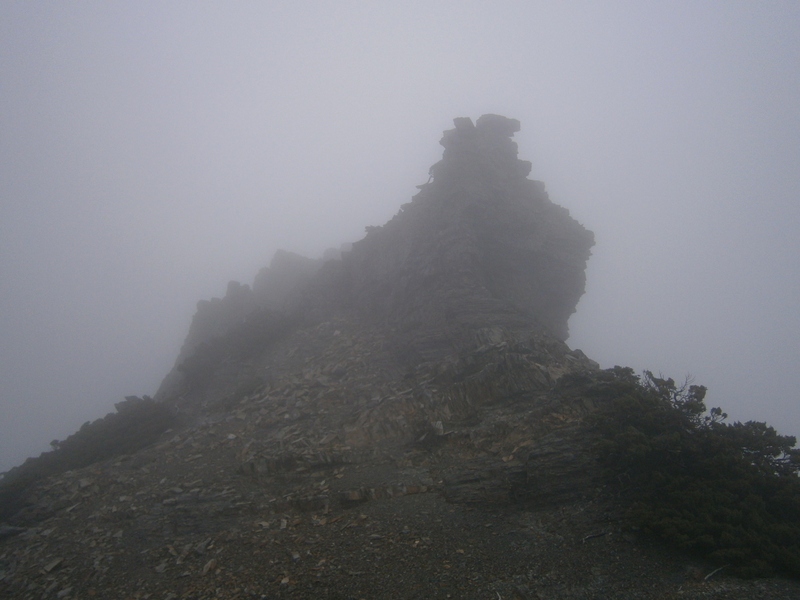 An easy mountain to climb, it was a bit difficult to find due to the fog and twisting ridge. 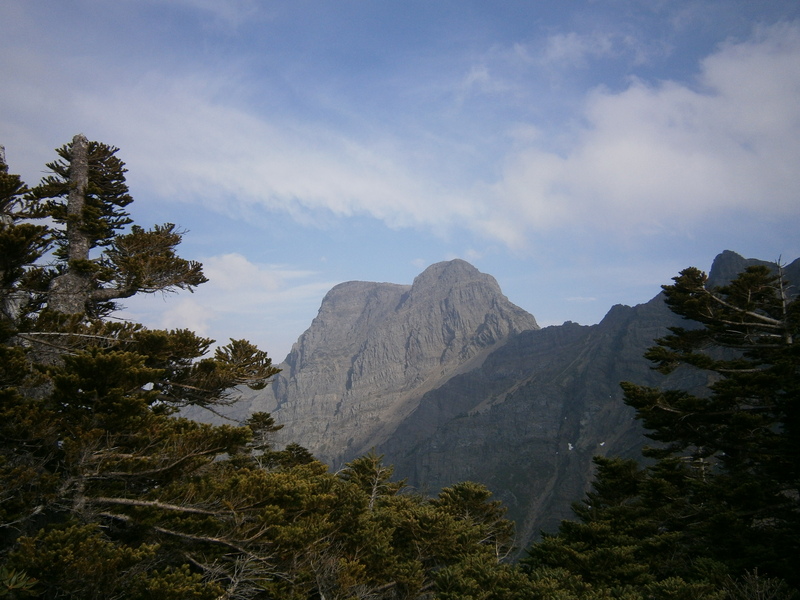 In stark contrast to the South Summit, Dongxiaonan Shan is a softly-rounded dome. On top of Dongxiaonan Shan. Returning to Yuanfong the trail was immersed in fog, and I spent ~45 minutes lost, just blindly following the jagged ridge-line north with no trail, using my compass to keep course. I got back to Yuanfong at 6:30, exhausted, and went to sleep after cooking up some hot dinner. 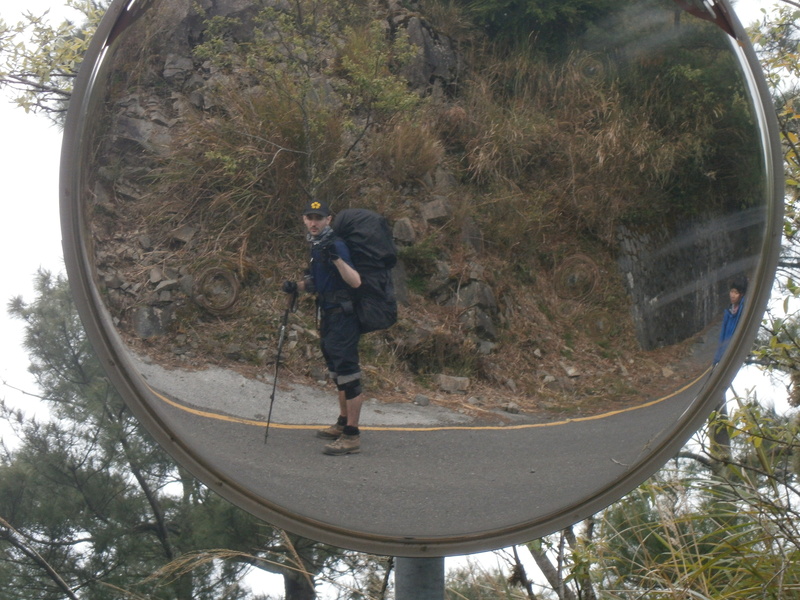 Day 2: Started hiking at 8:30 a.m., headed North towards the Main Peak. It was a clear, beautiful day, and the switchback trail up to the Main Peak, as well as the Peak itself, were both visible in the distance. 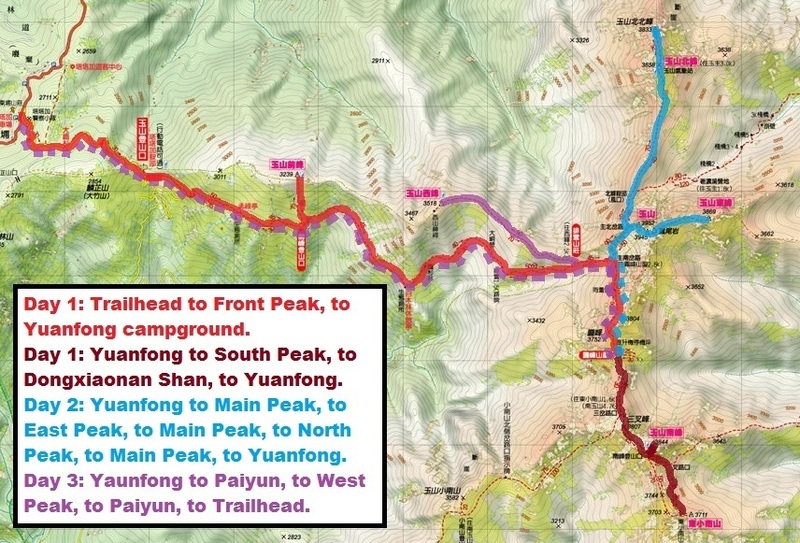 The route from Yuanfong towards the Main Peak. With very clear air, we had excellent views south towards Yuanfong. 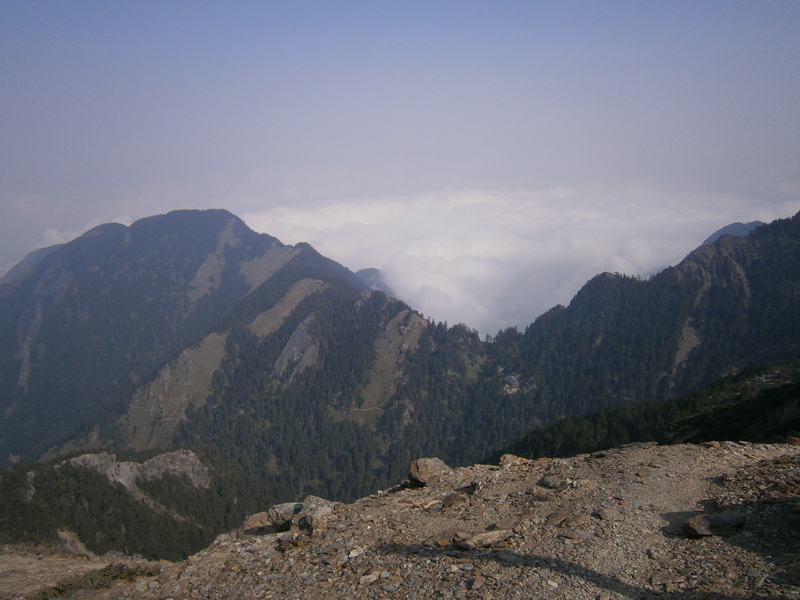 The trail to Yuanfong is clearly visible. We reached Jade Mountain’s 3952m Main Peak at around noon, and spent an hour celebrating, eating snacks, taking pictures, and enjoying the view. At the top of the Main Peak. Our group parted ways at 12:45 p.m. Two of my friends hadn’t slept well, and decided to descend to the trailhead and return home. The remaining two of us had slept like a pair of rocks in my tent, and were feeling well fueled by heaps of dumplings, meatballs, and noodles, so we were sticking to our plan. 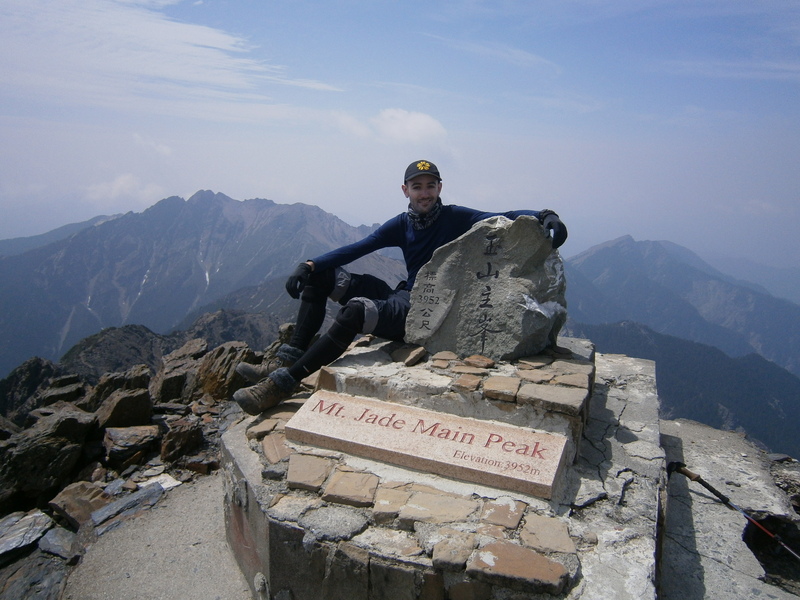 The next objective on my schedule was the impressive East Peak of Jade Mountain. It was clearly visible from the Main Peak, and looked daunting. 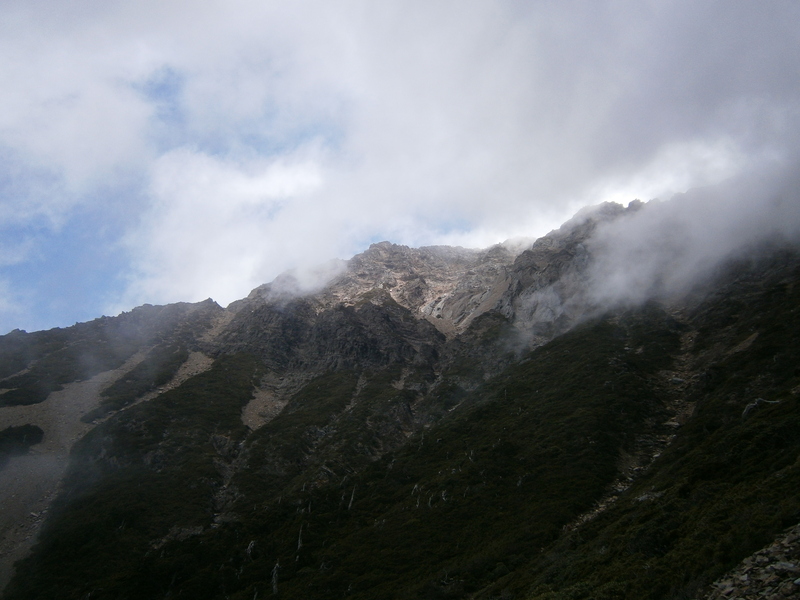 I descended Jade’s east face alone, sliding down steep scree to the eastern saddle. The summit of the East Peak, marked by a cairn of rocks, was clearly visible in the distance. The East Peak, seen from the eastern saddle. A close up of the East Peak. On top of the East Peak, the Main Peak in the background. 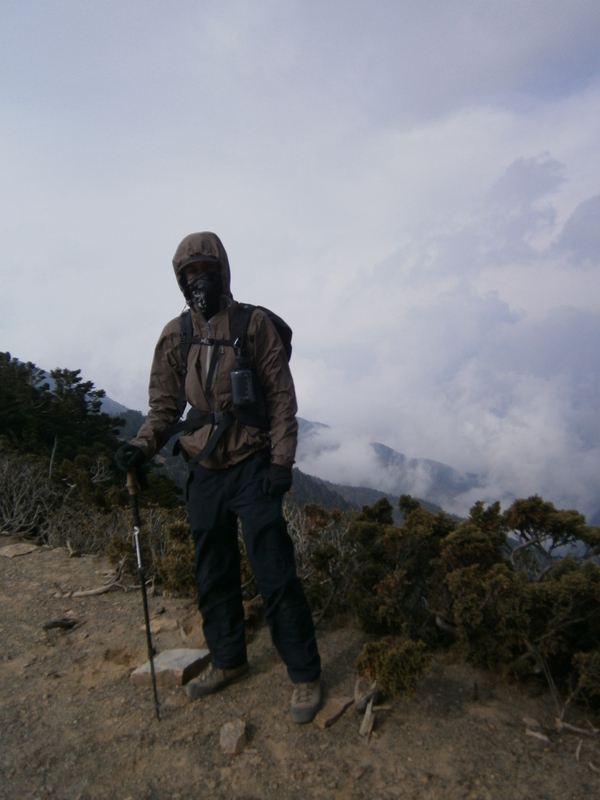 I reached the top of the East Peak (3869m) at 2 p.m. – a steep, exhilarating, and thoroughly entertaining climb to the top, and worth it for the views. I returned to the sheltered East Peak trail-head at 3 p.m., where I met my friend. Together, we descended the north ridge, headed towards the North Peak of Jade Mountain. It was cold and windy! Covered up in the wind. Taiwanese hikers sometimes do things a little bit differently than Westerners. 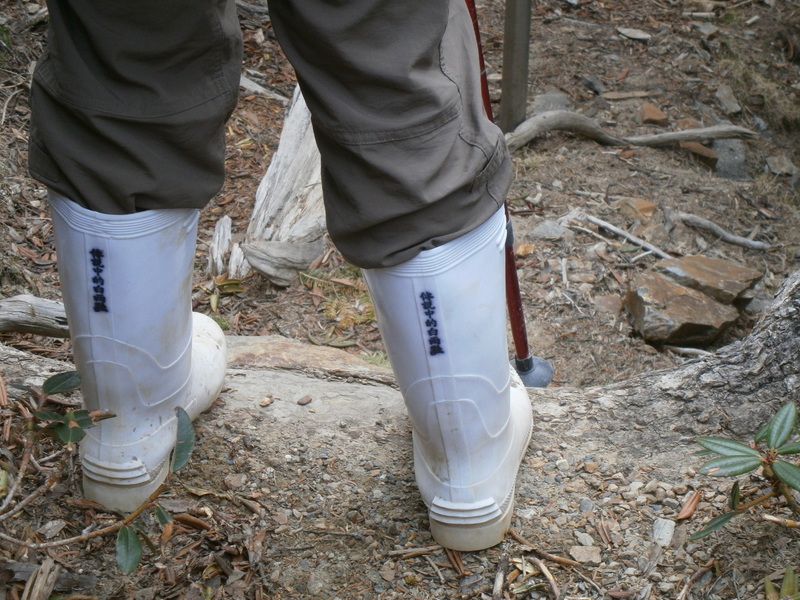 For one, rainboots are widely regarded as footwear well-suited for hiking. This makes sense, when one considers Taiwan’s consistently inclement weather, mud, leeches, and sharp rocks. Rainboots are cheap, waterproof, and difficult to ruin. A Taiwanese friend whom I’d met climbing on Snow Mountain and Beichatian Shan (he was using his own pair of rainboots to hike in deep snow and sub-zero weather on Snow Mountain in January!) helped us out for this trip, and gave my friend a pair of top-end rainboots for climbing Jade. Not your standard rainboots, these have thickly padded insoles, grippier outsoles, and bold styling: the Chinese says “Legendary White Rainboots”. 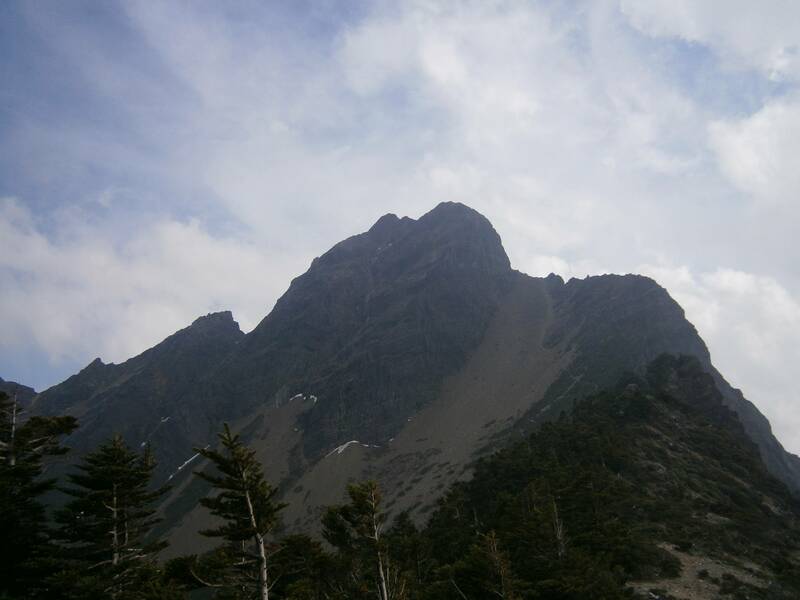 In addition to great views of the Main peak, the East Peak was clearly visible from the north ridge trail. 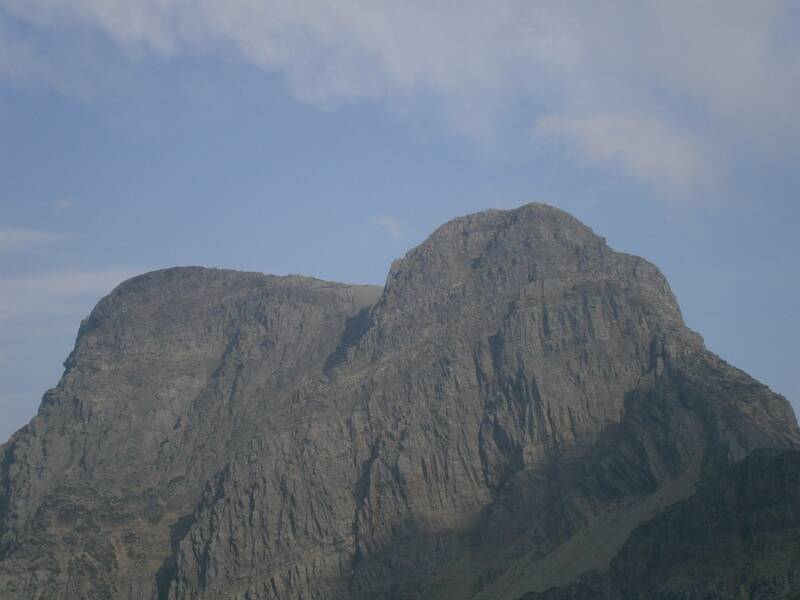 The Main Peak towers above the north ridge. 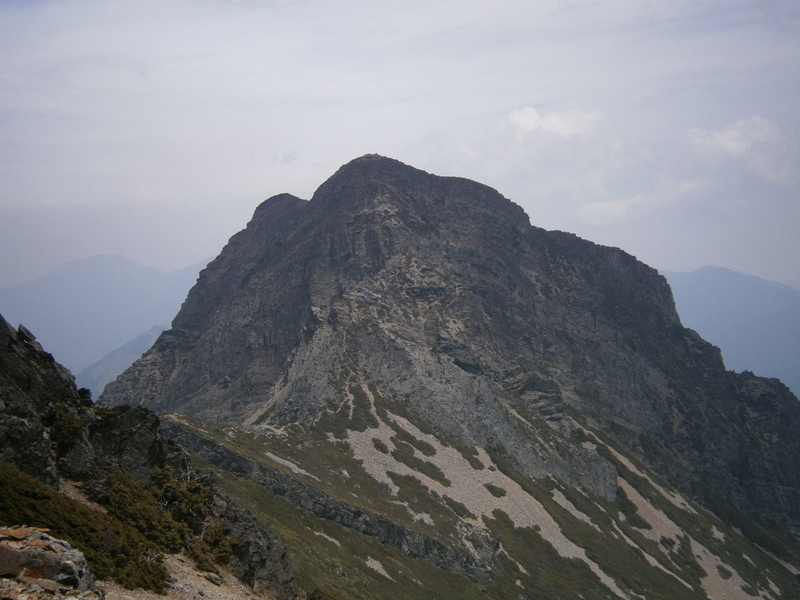 The East Peak was prominent and clearly visible from the north ridge. 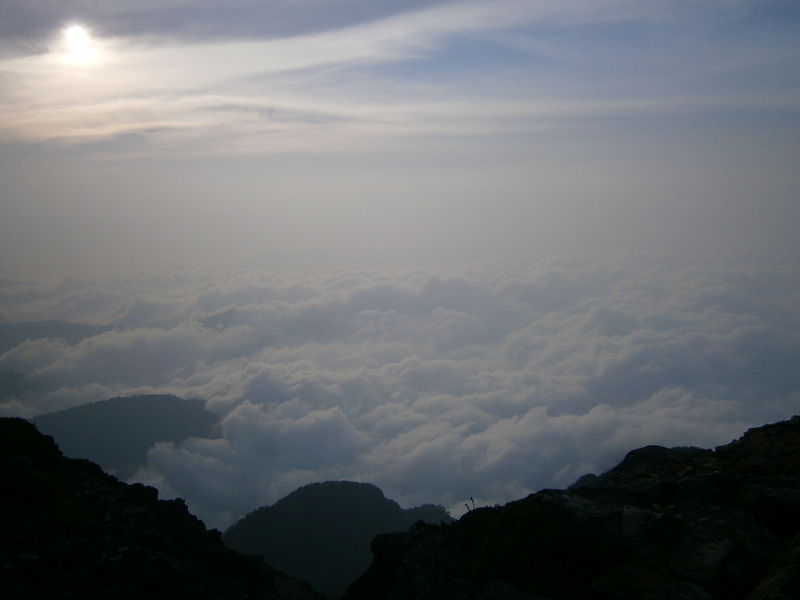 We reached the North Peak (3858m) at around 5 p.m. We had amazing views of the North ridge, the Main Peak, the East Peak, and a billowing sea of clouds. On the North Peak of Jade Mountain. Our view of Jade Mountain’s Main Peak and East Peak. The sea of clouds north of the North Peak stretched into the horizon. We took our time returning to Yuanfong, enjoying a bright moon and near-cloudless sky full of stars. 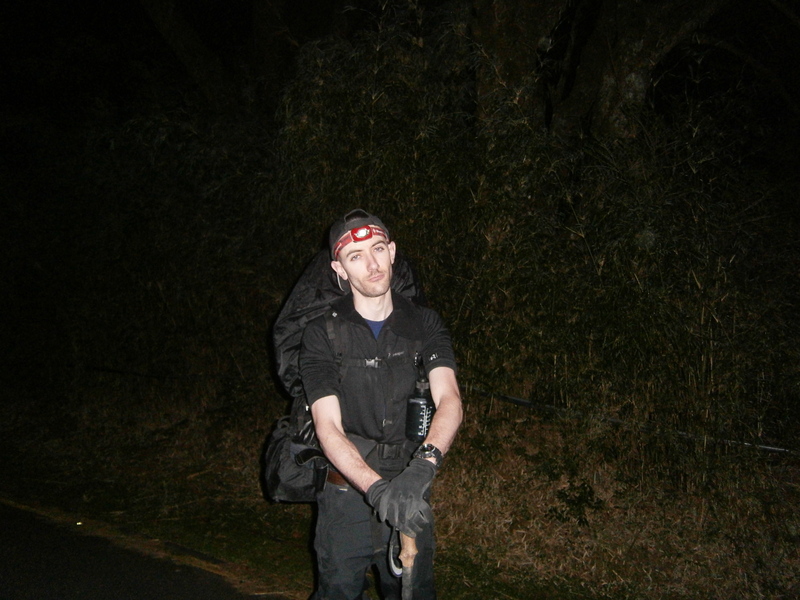 We got back to camp at 9:30 p.m. – a long 13 hour day for me, and a solid 11 hours for my friend. Day 3: Packed everything up, and started hiking at 8:30 a.m. We still had perfect weather! All packed up, we departed Yuanfong. The hut (and water source), seen here, is very basic – our tent was far more comfortable. Looking down at the Yuanfong campsite. We reached Paiyun lodge at 10 a.m., and took a break. The lodge is placed for the convenience hikers who only wish to climb the Main Peak of Jade Mountain, and was under renovation at the time of our trip. 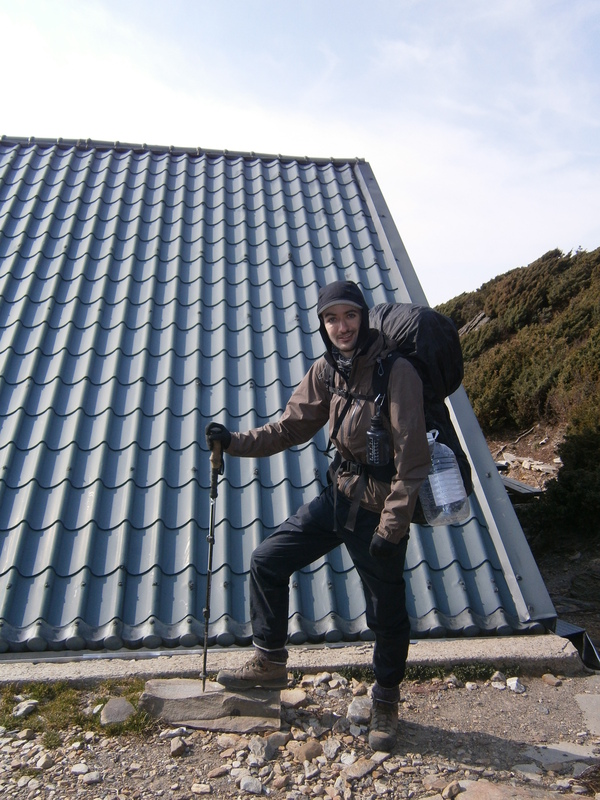 When it is completed, the mountain’s Main Peak will be very accessible, and much, much easier. The campsite we used adds another ~2 hours round-trip to any overnight trip involving the Main, North, or East peaks, but is conveniently located with access to the southern ridge. Paiyun lodge, right on the western saddle. The west ridge and the West Peak are to the left. We reached the West Peak (3518m) at noon, and were back at Paiyun to cook up a hot lunch by 1 p.m.
On the West Peak of Jade Mountain. Descending, we reached the trailhead and our motorcycle at 5 p.m. A long drive, followed by a longer bus ride, and we were back in Taipei at 3 a.m. This trip was better than I could have imagined. My friends had a fantastic time, the weather was perfect, our food was delicious and worth carrying, and all four of us accomplished our respective goals. Loaded up with camping gear on the way out. We chose to use the Yuanfong campground, and brought a tent. Yuanfong campground is above the treeline, and thus is very cold and windy year-round, but has plenty of space for pitching. If one desires, “bedspace” (I use that term very loosely – you sleep on the floor) at the Yuanfong hut can be booked. 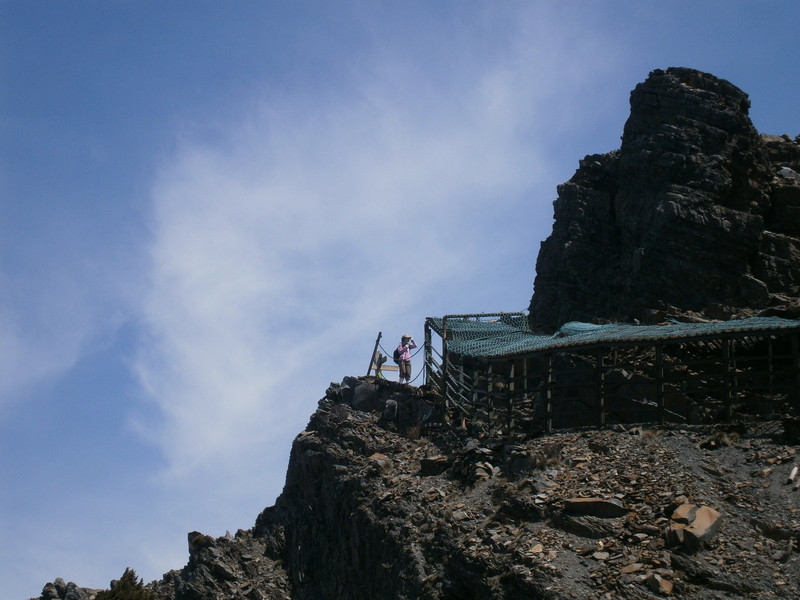 At the time of writing, the Paiyun cabin – the use of which would make climbing the Main Peak easier – is still closed for construction. It will probably open soon. Using Yuanfong to overnight is a viable alternative to Paiyun, although it does add a good ~2 hours of hiking on the first day. Yuanfong has a reliable water source; the rainwater reservoirs were half full when we visited, despite the dry weather which the area had been experiencing. 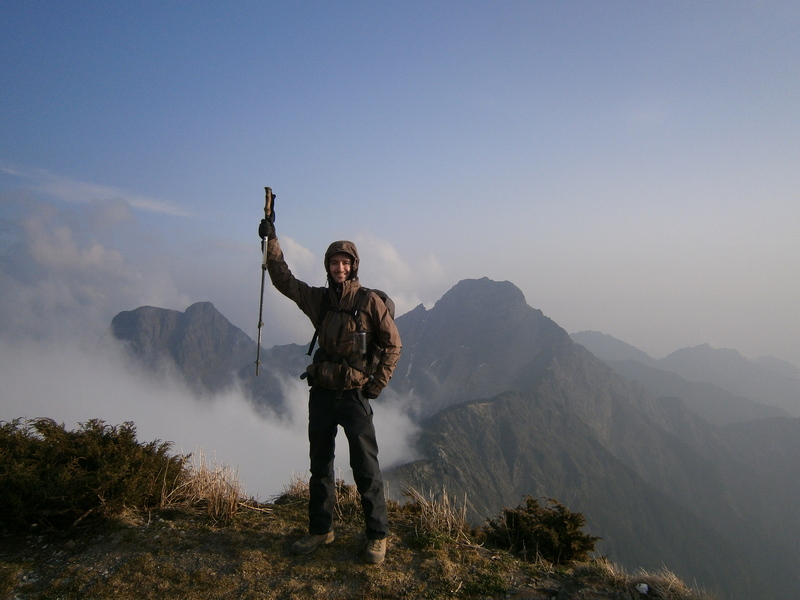 It is also possible to make a single-day ascent/descent of the Main Peak (and, with determination, probably one of the East, or North, or West peaks as well), provided you can illustrate experience and physical fitness – email the permit application staff through the Yushan National Park website (linked below) to obtain the paperwork for this. 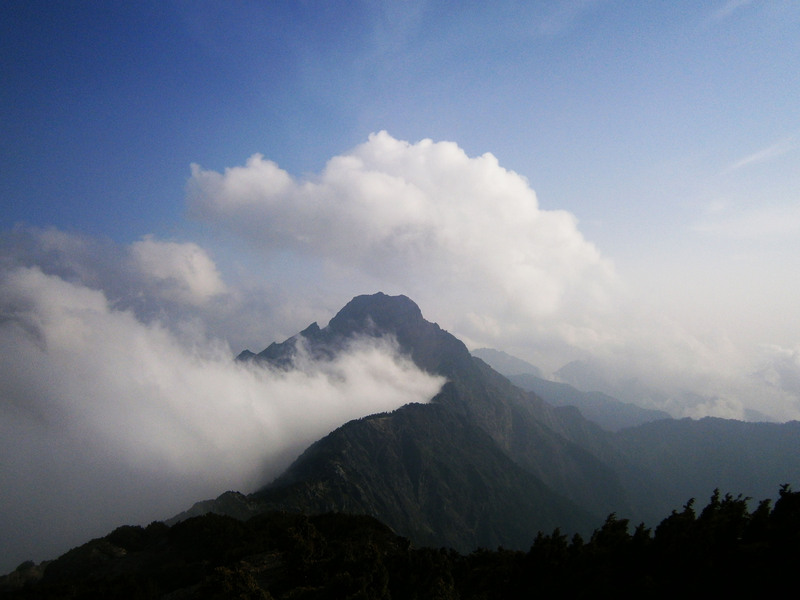 This entry was posted in Hiking, Taiwan - 台灣, Yushan National Park (Jade Mountain) - 玉山國家公園 and tagged 玉山, 玉山西峰, 玉山前峰, 玉山北峰, 玉山南峰, 玉山東峰, 玉山主峰, Dongxiaonan Shan, Jade Mountain, Jade Mountain East Peak, Jade Mountain Front Peak, Jade Mountain North Peak, Jade Mountain South Peak, Jade Mountain West Peak, Taiwan Hiking, Yu Shan, Yushan, 東小南山 by Ian. Bookmark the permalink.